This PDF 1.5 document has been generated by Microsoft Word - FORMAL INTERNSHIP PROJECT AGREEMENT.doc / Nuance PDF Create, and has been sent on pdf-archive.com on 14/09/2017 at 15:33, from IP address 138.250.x.x. The current document download page has been viewed 136 times. FOR THE SPONSORSHIP OF A MASTERS IN MANAGEMENT INTERNSHIP PROJECT. Office Hours for Student: ………………………………………………………………………………………..
end of the Internship Project. Supervisor and the Student to gain feedback on the progress of the Student. agrees it is entirely responsible for any use to which it puts such information. 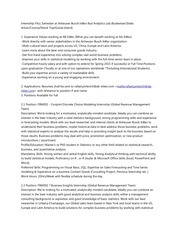 prevailing rate (if applicable), to Cranfield University, in respect of the Internship Project. Internship Project once I am committed to the Internship Project Provider. 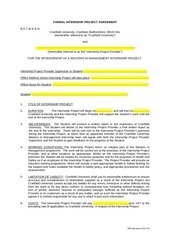 those of the Internship Project Provider. This file has been shared by a user of PDF Archive. Document ID: 00673598.